Natural gas consumption for the average rural consumer in Alberta is 272 gigajoules (GJs) per year, as compared to consumption of 120 GJs per year for the average urban residential consumer. Rural consumption, however, may be significantly higher for larger operations such as farming, ranching, poultry and pork facilities, grain drying, irrigation, and Hutterite Colonies. Dwellings and associated buildings account for approximately 65% of the total consumption for space and water heating that occurs in the winter period. Natural gas is utilized by furnaces, hot water tanks and various appliances such as stoves, clothes dryers and fireplaces. Commercial enterprises within our customers’ franchise areas also utilize natural gas mainly for heating purposes. Commercial consumers include businesses, institutions, schools, office buildings, hotels, hospitals, restaurants, greenhouses, and other non-manufacturing operations. Large commercial enterprises may also use natural gas for on-site electricity generation as an economical alternative to purchasing electricity off-site. Approximately 70% of the total natural gas consumed in Alberta is used by the industrial sector for manufacturing or processing purposes, such as petroleum refining, fuel for natural gas compressors and processing of chemicals and food products. Natural gas and its by-products are also used in the manufacturing of products such as fertilizers and plastics. Industrial consumers in our shareholders’ franchise areas that consume in excess of 10,000 GJs may elect for Industrial Transportation service, or contract their natural gas supply through marketers, such as Gas Alberta Energy. Gas Alberta Inc. is the exclusive supplier of natural gas to its utility customers. Prior to the start of each month, Gas Alberta designs a gas rate for the upcoming month to cover its estimated gas costs for the upcoming month (see Gas Rates in Alberta). The amount of this monthly pooled rate is then forwarded to customers so they can bill their consumers. Costs incurred by the utilities for delivering gas to the consumer, including the construction, operation and maintenance of their gas distribution systems, as well as administrative costs for running their offices. The utilities bill their consumers around the 10th of each month and request payment by the first week of the following month. Their payment options may include equalization billing or pre-authorized withdrawal from consumers’ accounts. 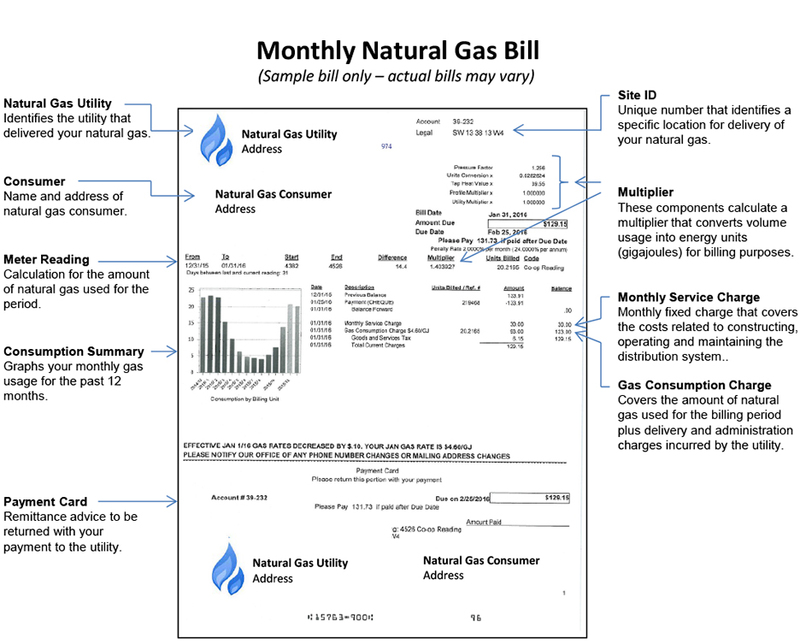 The following is an example of a monthly gas bill sent by our customers to their consumers. For a PDF copy, click here.